John Mallace was born in 1874 and attended George Heriot’s School from 1886-1887. He was then employed with Messrs. Dobson Molle & Co., in charge of the Machine Department. 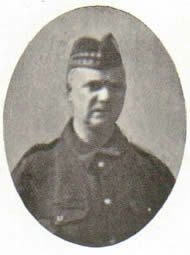 He was a Private in the Royal Scots in 1915; Lance-Corporal in 1916 when he served in Egypt. 1917 saw him in France. He died at a Casualty Clearing Station on 5th September 1918, of wounds received in action. He was the eldest son of the late Mr Alexander Mallace and of Mrs Mallace, 30 Morningside Park. His wife predeceased him by a few weeks. They have left a son. His name is on the St Michael’s memorial for WW1.